Dual Markup Engine: Switch between WAP 1.1 (WML markup) and TRUE WAP 2.0* (XHTML MP markup) WiStyles on the fly!. WiForums will also monitor a user's phone browser capability; if a member selects XHTML MP markup in MyPrefs, and then switches to a WML only phone, WiForums will then change his/her markup preferences to WML on the fly, ensuring a trouble free browsing experience. *XHTML-MP markup with compliant content-type that invokes a browser's quick XML parser. 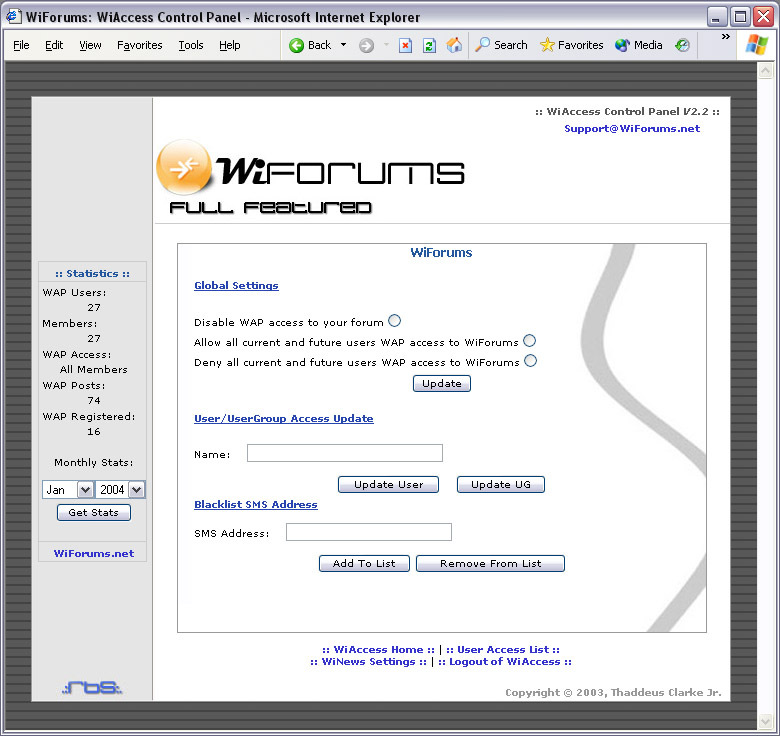 Automated Device Compatibility Updates (ADCU): WiForums installations will periodically query our server for any new device compatibility updates, and when necessary, update themselves to ensure that all WML and XHTML-MP compliant devices can access your wireless forum. Quick Replies: An inline "Quick Reply" form which is displayed in xHTML MP WiStyles whenever a member is reading a PM, or viewing a topic. Implements PURE WCSS: Not a single table is used; however with the use of key bandwidth efficient XHTML-MP/WAP 2.0 elements, the default XHTML MP WiStyle has the appearance of your typical eye catching PC forum. Intuitive "Displayable on Demand" Menu System: Every menu link in any XHTML WiStyle implements the accesskey attribute. Keying in '0' will always bring you to the menu (displayed at the bottom of the page). Keying in '9' will always bring you to the top of the page (where you can access the navigation links). WiContacts: Is a 'buddy list' which is populated with the names and online status of a forum member's wireless private message recipients, allowing a member to quickly send them private messages. Mass PM deletion: Wireless forum members can delete all of their inbox and sent private messages in one tap. WiForums IPF GUI Installer: WiForums FF is now packaged into a Windows application that will allow you to install WiForums to a remote server and also configure you installation. For those who do not use Windows, a ZIP distribution package is also available. WiForums PIE AHM - MS Pocket PC Edition & MS SmartPhone Edition: These WM applications can be used to ensure that Pocket IE is compatible with WiForums FF v3. WiNews: By simply entering your news database/table schema details in WiAccess, you will allow WiNews to create a dynamic RSS based news feed of your website news which can be accessed via the "Latest Headlines" link on your wireless forum. Alternatively, WiNews also allows you to use a RSS feed from an external source. WiChat: Allows your members to have live instant messenger like group chat sessions with smilies. Among other things, members can send WiChat invitations to other forum members requesting them to join the chat. Top 10 WiPosters: Wireless forum users will be able to view the forum's Top 10 Wireless Posters and their respective wireless post counts. Email based SMS PM Notifications. Wireless Member Registrations: Guests can register on your WiForums discussion forum and also have access to your vBulletin/phpBB2/IPB based discussion forum. Illegal usernames set via vBulletin/phpBB2/IPB are enforced. The ability to offer cellular based member registrations should easily get your forum into a carrier's WAP menu; allowing you to reach those you could have never reached before! Search Capabilities: A global 'Search' option is located in the forum's main menu and a 'Search Forum' menu option is present in every forum that a user enters which contains a list of topics. The topic listings 'Search Forum' option enables a user to narrow the search scope to that of topics and posts which are located in the specific forum that they are in. My Forums: Allows a user to quickly access their WiForums and vBulletin/phpBB2/IPB subscribed (watched) forums. My Forums also allows users to subscribe and unsubscribe from forums. My Topics: Allows a user to quickly access their WiForums and vBulletin/phpBB2/IPB subscribed (watched) topics. My Topics also allows users to subscribe and unsubscribe from topics. "Automatic Quoting": Appends a post to your reply ( a "[Quote]" link is displayed below each post). - Select which WiStyle they would like to use. Support for vB3's "ignore" lists when viewing a topic. A unified (forum wide) on screen navigation system which greatly reduces the need for multiple presses of the "back" key, which in turn speeds up access to previously viewed pages. PM sent from the wireless forum contain a 'Wirelessly Posted' remark when being read in vB/phpBB2/IPB. The default XHTML MP/WAP 2.0 WiStyle, which could simply be defined as mobile "Eye Candy"